Let's face it. Baking and cooking gluten-free is not always easy. There are a lot of variables that can make or break you recipe. Make a mistake with the gluten-free flour you're using, and your whole cake will be ca-put. Same with cooking. How are you supposed to get that wonderful, crispy layer on top of your casserole if you can't use bread crumbs? With these Gluten-Free Baking Tips: A Guide to Gluten-Free Flours, we give you easy substitutions for gluten-free flours and more. Luckily, there are a ton of tricks that you can do to make the most out of your food sans gluten. 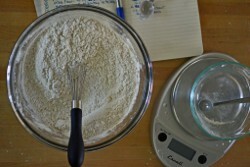 Flour is the biggest challenge gluten-free bakers face. There are plenty of gluten-free flours out there, but when it comes to baking a cake, you cannot just replace the all-purpose flour with gluten-free flour cup-for-cup. Unfortunately, the flours don't work the same way since the gluten-free flours, well, don't have any gluten, which acts as a binding agent in the dough or batter. Your recipe calls for breadcrumbs. Since you are now gluten-free (or have been for a while), you know you can't add this ingredient. Without it, though, something is definitely missing from the end result. This is a common problem faced by many gluten-free cooks. And there are many different things you can substitute in place of breadcrumbs. Make your own! Make gluten-free bread and then create your own crumbs. Nuts instead of croutons. They will add that extra crunch to your salad. Oats for breadcrumbs. Blend them into the same texture and size as breadcrumbs. Lettuce wraps in place of sandwich bread. Corn tortillas instead of flour tortillas (or bread). Buy a spiralizer and turn veggies into noodles. Zucchinis are great for this. Spaghetti squash in place of...well, spaghetti. Do you have any tips of tricks for making something gluten-free? Share them in the comments below!